We’d love your help. Let us know what’s wrong with this preview of Fyrebyrne Island by Ash Oldfield. The time has come for thirteen-year-old Rachaya to embrace her dragon heritage. Not everyone is pleased by her arrival on the dragon sanctuary, Fyrebyrne Island, however, and her mother's enemies may well have become her own. To ask other readers questions about Fyrebyrne Island, please sign up. This is the perfect book for a thirteen year old girl - and if I was thirteen year old me again I would have adored this book, drawn pictures of the characters, and become lost in the magnificent world that Ash Oldfield has created. The story is about thirteen year old Rachaya who - very quickly discovers that she is of dragon heritage and this knowledge sweeps her into an incredible new world of dragons and wizards - learning their ways and laws, but also the perils that await one of royal birt This is the perfect book for a thirteen year old girl - and if I was thirteen year old me again I would have adored this book, drawn pictures of the characters, and become lost in the magnificent world that Ash Oldfield has created. The story is about thirteen year old Rachaya who - very quickly discovers that she is of dragon heritage and this knowledge sweeps her into an incredible new world of dragons and wizards - learning their ways and laws, but also the perils that await one of royal birth. I was actually really pleasantly surprised by the tension between Dragons and Wizards and the 'reasons' for these tensions. I am overly fond of political intrigue in fantasy, so that may have been what tickled my fancy about this book - as I felt it was political enough that I could enjoy it, but I could also feel comfortable enough to pass it onto nieces and nephews in the future. It's a lovely mixture of what makes fantasy beautiful and exciting. There is a bit of Harry Potter "boarding school", a bit of Narnia's "magical land", along-side really good world-building and interesting characters. I'm looking forward to picking up the next book in the series. This was a hugely enjoyable, light hearted read. I look forward to reading more of this series, or as anything else by this author. What a really cool book. I have not read many dragon books but after reading this I want to read more. I love how the characters change from human to dragon form - I want to be a dragon. I met Ash Oldfield at Melbourne Supanova where I found out that I was a fire dragon. There are elements of this book that remind me of others I have read - it reminds me of Harry Potter as the majority of the book is set a magical school. The school that Rachaya attends, Wyvolds the Fierce School for Dragons, has What a really cool book. I have not read many dragon books but after reading this I want to read more. I love how the characters change from human to dragon form - I want to be a dragon. I met Ash Oldfield at Melbourne Supanova where I found out that I was a fire dragon. There are elements of this book that remind me of others I have read - it reminds me of Harry Potter as the majority of the book is set a magical school. The school that Rachaya attends, Wyvolds the Fierce School for Dragons, has an interesting and possibly smart schooling system where the students do not move up a grade until they have built up the skills. What a fantastic book. Can not wait for the second book to find out more. 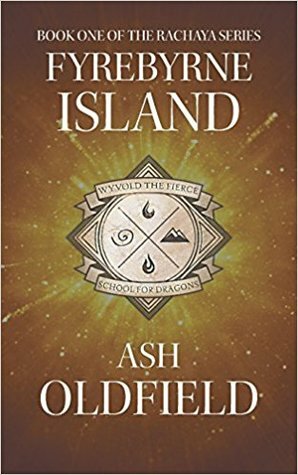 When she is not working on her Ash Oldfield is a fantasy fiction and children’s writer from Melbourne, Australia. Always having a love for the written word, Ash wrote her first stories by moonlight at the tender age of five, long after her parents thought she had gone to bed. To this very day Ash still prefers to write by the light of the moon long after any sensible person has succumbed to sleep.